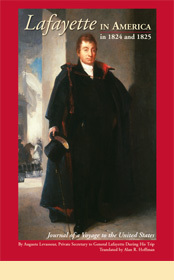 Lafayette in America in 1824 and 1825 (Lafayette Press, 2007) is the first unabridged translation of a journal kept during the Revolutionary War hero’s final trip to the United States. Translated by Boston lawyer Alan R. Hoffman, it offers a detailed description of the overwhelming welcome the “boy general” — by then in his late 60s — received. His face was imprinted on banners, fine china, and women’s gloves. The smallest of towns wildly celebrated his arrival, and he felt compelled to visit all 24 states. Written by Lafayette’s scribe and traveling companion, August Levasseur, the journal also provides a snapshot of a nation not yet 50 and full of energy and optimism; proud of its successful revolution and growing rapidly.